In the sparkling new visitor’s center here at Gunung Mulu National Park in Borneo, an introductory film runs all day long, describing the unique limestone formations of the park, a million bats leaving the Deer Cave each night, the forest types and fauna of the park, and its recent designation as a UNESCO World Heritage Site. Gunung Mulu, it intones, was a “trackless wilderness” before the park was formed in 1974. And for the purposes of the tourist industry, that was indeed the case. But for the local indigenous people, the settled Berawan who hunted in the area and the nomadic Penan, for whom Mulu was home, the “wilderness” was constrained even back then by paths. I have been trying to picture these people subsisting in the forest around us and I still find, even after two weeks here, that my imagination is circumscribed by the civilized constructions that make the setting for the daily stuff of our lives here; eating in a café, sleeping in a climate-controlled room, walking on boardwalks. I am aided by books written by previous visitors to this part of Sarawak, scientists who have provided photographs of Penan and Berawan as they were when this park was formed, almost four decades ago. These give me a feeling of connection to them, for their faces are recognizable—they are certainly the ancestors of the people who work in the park today. 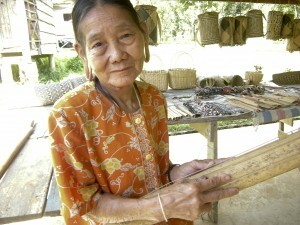 An elderly Penan woman with stretched earlobes plays a bamboo instrument at the craft market at Batu Bungon. The shape of a jawline or brow reminds me of a park guide, the stretched earlobes that were once very common here remind me of an elderly craftswoman we met at a nearby market. The photos show men in loincloths with tubes at their waist holding arrows for their blow-guns. The women and girls wear sarongs, often only from the waist down, and I can’t help but imagine looking down to find a terrestrial leech (in addition to the rather large human leech that I already sustain!) on my breast. The young Penan and Berawan who work in the park today, for all their facial resemblance to these grainy photographs, wear tight sloganed t-shirts and skinny jeans, and play badly aging club mixes on the café soundsystem when the park director isn’t paying attention. Despite this discordance with our romanticized touristic notions of indigenous life, we have been granted a few chances to see the lingering influences of their cultural roots. These chances have almost all come at a remove from the intense management of the park headquarters. In order to find mushrooms, Bryn and his colleagues here have organized a number of trips to the outlying park “camps.” These are rustic structures, placed at critical junctures along the main hiking trails, some of which were built in 1977 and 1978, during an extensive Royal Geographical Society expedition to the newly formed park. Most have no potable water or any real facilities to speak of: they are platform with roofs, completed by cookstoves run on butane that must be hiked in to the camp. To carry the cans of butane, as well as everything else you need to survive for your time at camp, you hire porters. The porters that we met ranged in age from 19 to 39, but there were certainly older ones that we passed—or rather, that passed us—on the trails. Porters distribute the weight, packing kiwa before the researchers head up the summit trail. These tough men (for they are all men) carry cases of Tiger beer, kilos of rice and noodles, tins of sardines and tuna, bottles of drinking water, and cans of butane all on their backs. And often enough, below their feet, they wear nothing! Where this tourist employs all the ergonomic technology that I can muster to protect my tender muscles and tendons from a burden, carrying a pack fitted out with 20 different adjustable straps, contoured, breathable straps and back padding, and a waist belt molded to fit the particular shape of my very own hips, a porter carries a woven rucksack, called a kiwa (also known as a selabit or kiba or kibi, in various other local dialects), that is virtually identical to the ones his ancestors carried many generations ago: two shoulder straps of flat, woven rattan; an absolutely flat, stiffly woven back plate; and loosely woven netting on the sides, which is then laced together with more plant fiber, to accommodate loads of myriad shapes and sizes. At one point on the trail, our entomologist friend Chris Darling needed a break from his own ergonomic hiking pack. Naturally, the porter could not bear to carry this carefully engineered abomination of a backpack, and crammed it instead into his kiwa and carried on as before. It is thus that we stand aside, shamed if we thought we were really tough, and are passed, sometimes in two directions, by rapidly moving, nearly naked, barefoot guys with 20-30 kilos strapped to their backs. 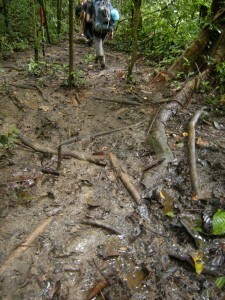 Off the beaten path—that is, off the raised wooden path, really—the trails are generally quite muddy. They may also be rocky and steep, though the steep ones usually have the benefit of rooted stairs, the natural flights that form when rain and footfall repeatedly wear away the soil on a forested slope. While the baby and I cannot really visit any of the more rudimentary camps, we had the pleasure of joining the scientists on a slightly tamer trek to Camp 5, a place that is more accessible, than the other camps. A boat ride reduces the walking distance to 8 km. Sleeping mats make for much more comfortable nights. And the value of a small staff that keeps plenty of water boiled for drinking is self-evident. The boat ride was one of the highlights for me and for the baby, who gets excited every time he sees a longboat or hears—and then mimics!—an engine buzz by the headquarters, just below the café. Along the river, you see the scattered settlements of locals, for whom the river is life. This seems like an obvious statement, for all humans tend to concentrate themselves near water. But in a lowland tropical rainforest, the river is more than just an efficient means of transport—it is the connection to world beyond walking distance. And walking distance means something different here, even for those accustomed to the rainforest; humans need trails, and to blaze a trail here in the era before chainsaws would have been both challenging and dangerous. Which brings me back to that trackless wilderness. Even today indigenous Borneans impress in their ability to negotiate the rainforest. But by its very existence, this cultural heritage, of familiarity with and experience in the wilderness, belies the notion of the wilderness itself, now or 40 years ago. When the researchers for the Royal Geographical Society expedition arrived here in 1977, it was a matter of hours before they found the remains of their first Penan settlement, clearly abandoned only days before their arrival. Soon enough, exploring the nearby forest, they began to suspect that some of the forest was secondary growth. In other words, parts of the forest had already been farmed and then abandoned, left for the forest to reclaim. 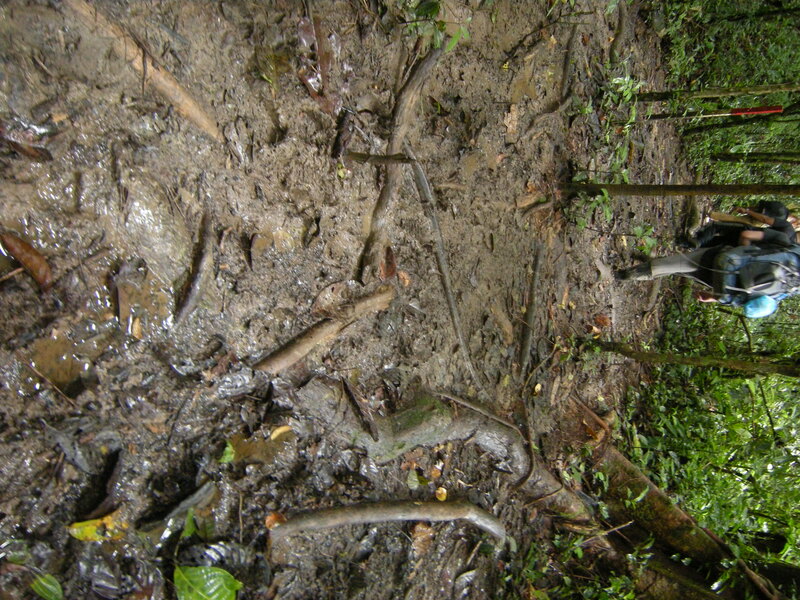 The head of this expedition recounts how he and a companion toiled, breaking a trail into a part of the forest they believed had never been visited by humans. They broke through dense vegetation into a clearing with a stream, only to find two young Penan children splashing unconcernedly in the water—children they knew, in fact, because their family had settled near the researchers’ longhouse. So, for all my previous pondering of “apartness” from nature and “immersion” in nature, I must admit, I do not really know what even I mean myself by “nature.” The wilderness is full of mysterious, hidden lives, including those of humans; and even without raised wooden walkways, it is also full of tracks. We humans perambulate, packing our babies and belongings up in woven rucksacks, moving from place to place, following food and opportunity. And making tracks in the wilderness that lead home means that the wilderness has been, in a literal sense, domesticated. Next → Next post: A day in the life of a field mycologist.